AT&T was the biggest joke of South by Southwest last year. 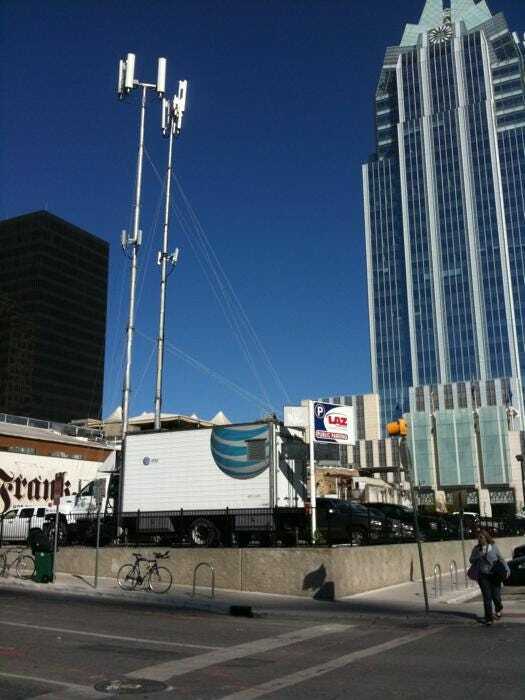 The thousands of iPhone owners flocking to Austin crushed its 3G network, making it useless. This year, it’s rolling in a bunch of extra gear to try and make sure it can handle demand — and avoid extending its streak as tech’s favourite punching bag. Besides AT&T’s reputation at stake, several other companies — including Foursquare and Gowalla — are counting on AT&T’s network being reliable to power their iPhone apps. We’ll see this weekend if AT&T can keep up with the iPhone crush. Distributed Antenna System (DAS) at the Austin Convention centre. o This system provides the equivalent coverage of eight cell sites, with 50 antenna nodes providing coverage throughout the venue. o The system was completed in recent weeks. · Dramatic expansion of network capacity from cell sites to user devices. o Over the past year, we’ve moved from one radio network “carrier” to three, which enables us to support more traffic over existing spectrum. o We’ve expanded capacity using high-quality 850 MHz spectrum, which also offers improvements to in-building coverage via a signal that can better penetrate walls than signals at other frequencies. o We have deployed HSPA 7.2 software at all of our 3G cell towers nationwide. While this upgrade is not expected to provide a noticeable immediate boost in average speeds until Ethernet backhaul is in place, it does result in a better overall customer experience by generally improving consistency in accessing data sessions. It also prepares the network for faster speeds and increases network efficiency. · Three temporary cell sites. o Two Cells on Wheels (COWS) will be used, as well as a third temporary site on a building rooftop. o The three temporary sites will provide AT&T Wi-Fi as well as 3G service. o These temporary sites are being placed to maximise coverage in areas of the city where we expect to see the highest levels of network traffic during the event. · Augmented backhaul capacity to cell sites surrounding the event venues. o Compared with last year, we have added fibre-optic connections to more than quadruple the backhaul capacity of each of the eight cell sites that serve the event area, and temporary sites will also be served by extensive backhaul. · A team of AT&T network engineers will monitor our network 24/7 throughout the duration of the event to help ensure the network’s performance is meeting our customers’ needs. · We worked directly with SXSW organisers to develop and implement our network enhancement plans.